1 The Beatmasters feat. MC Merlin "Who's In The House"
4 Groove Committee "I Want You To Know"
6 Sandy Rivera feat. Sabrynaah Pope "Come On"
7 Underground Commitment "I Know a Melody"
11 The Nick Jones Experience "Mighty Different Instrumental"
2 Playin´4 The City "Spirits"
4 Insatiable feat. Monè "Your Love"
5 Boogie Balo "Don´t Shut Me Out"
10 The Nick Jones Experience "Route 22"
12 Total Eclipse feat. 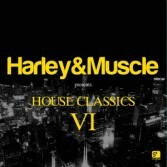 Ronnie Canada "Come Together"
13 William Rosario "London Fog"
Sesta edizione della serie "House Classic". 26 Tracce che hanno scritto la storia della House Music. Kym Mazelle , Lisa Stansfield, Mark Grant e molti altri.